We recently heard some details about the new BlackBerry Porsche Design P9982 smartphone, and now a video has appeared online which gives us a look at this new Porsche design handset from BlackBerry. 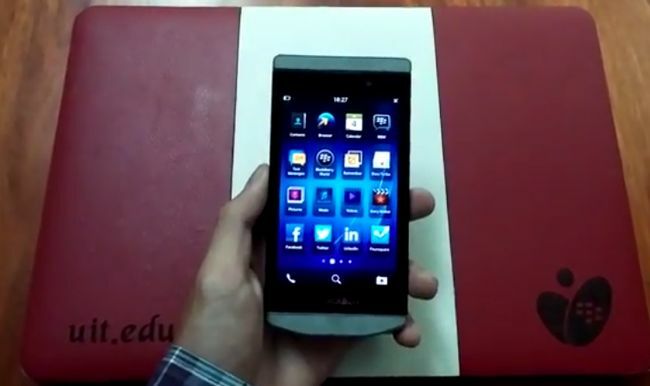 The BlackBerry Porsche Design P9982 is expected to have the same hardware specifications at the BlackBerry Z10, although as you can see from the video below, the handset features a new design, and it will come with BlackBerry 10. This new Porsche Design BlackBerry P9982 is expected to retail for around $2,000, and will apparently go on sale before the end of the year. The BlackBerry Porsche Design P9982 is expected to feature a 4.2 inch HD display with a resolution of 1280 x 768 pixels, the device will also come with a dual core 1.5GHz processor. Other specification on the handset will include 2GB of RAM and 16GB of built in storage, the device may also come with a mciroSD card slot like the Z10. We are expecting the cameras on the BlackBerry Porsche Design P9982 to be the same as the Z10, which would mean that we would have a 2 megapixel front facing camera and an 8 megapixel rear facing 1080p camera.